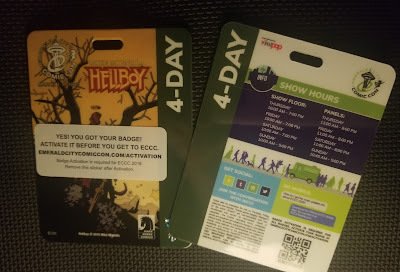 Emerald City Comicon is just days away - are you ready? Game it up. Level 2 has it all for you, board games, arcade games, RPG, demos and more. Thursday, Friday and Saturday nights have gaming after dark for those of you over 18. Catch a burlesque show. Or gay it up at Qomix, bask in the genius of Jonathan Coulton or go to Kracklefest. Lots to keep you busy at night. Get educated. Panels for librarians and educators will be at the Seattle Public Library, with topics on planning library programs, graphic novels for kids, lesson plans, LGBTQ work and more. Try the official ECCC beer. Dark Heron will be available at the beer garden but also at various bars and restaurants. On that note, if you're not familiar with Seattle, you should check out the food guide. Everyone tends to gravitate to the Cheesecake Factory across the street where you have to wait an hour but just walking a block or two gives you great options. Go to a Schoolism LIVE workshop. These cover character design, gaming, animation - you get the idea. Sample the small businesses of Seattle. Speaking of avoiding chain restaurants, ECCC is bringing you Homegrown, a collection of local artists, bakers, entrepreneurs, musicians and more. You have to admit, this is a refreshing change from Cons that only put out the same generic, mass-produced offerings you can get back home. Pick out your panels. Yes, there's a decided bent to ECCC panels and sometimes it seems like there's 134 different panels on "How to Be a Plus-Size LGBT Cosplayer Who's Editing A Comic Anthology about Diversity." But there are plenty of fan meetups, book and comic topics and really anything you might be looking for. Take your little nerds to Family HQ. Legos, cosplay, Star Wars - this is clearly where the action is. Activate your badge. That's required, actually. And if you're overwhelmed by all this, check out the fan guides for day by day assistance. And if you haven't yet, I recommend downloading the app - it really will help you keep your panels and activities straight.